Senior captain Jess Small, sophomore Vinni Jacobs, assistant Rory Buchenroth and robotics coach Paul McFarlin draw up plans for their robot. Photo by QUINN SPOONER. In 2005, Paul McFarlin and seven Carmel students created CHS’ first robotics team. Now, more than a decade later, Carmel’s robotics program has grown into an institution that will surely reflect McFarlin’s legacy after he retires at the end of this school year. Carmel’s robotics team now has over 50 members, including a large number of underclassmen, implying that their numbers will only grow as the years advance. Before moving to Carmel to start the Robo Rockin Bots, aka Team 2035, McFarlin gained experience in robotics at his former school, located in Los Angeles. Teams like McFarlin’s 599 and 2035—named such because they were the 599th and 2035th teams started, respectively—all compete in the international FIRST Robotics Competition, also known as the FRC, a contest that Carmel has excelled in since the program started. 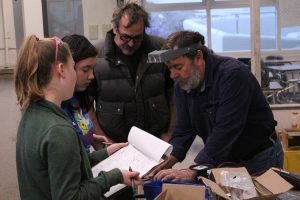 Although McFarlin is undoubtedly an expert in all things robotics, what makes the team great is their student-led nature; the automotive/engineering/industrial arts teacher is able to take a step back and let the students learn for themselves while simultaneously giving advice and answering any questions asked of him. This gives the team members a rare opportunity to use the most intricate machines the shop has to offer, such as the computer numerical control machine, a programmed tool used to make extremely precise cuts. Team members also use dangerous machines like the band saw, a blade made from a continuous band of spinning metal teeth, without supervision. One can only imagine the horror stories McFarlin has accrued over the years, being surrounded by inexperienced teenagers and deadly pieces of machinery; unless you’ve ever had him as a teacher, that is, in which case he’s made sure to tell you every gruesome detail. This freedom that McFarlin gives his team not only increases their efficiency, but also encourages great learning experiences for every single member of the Rockin Bots, from the coders to the welders. The educator has taught industrial arts, engineering, stagecraft and automotives for 39 years, and built 16 robots during his time spent between two schools. This year, though, will mark the end of his long teaching career, from which he will undoubtedly be missed. Paul McFarlin has taken it upon himself to not only help Carmel’s robotics program, but also the programs of schools across the peninsula. He has reached out to eight other high schools in the area to help them start robotics programs of their own. McFarlin has lent a hand in starting teams from Seaside, Monterey, Pacific Grove, York, Santa Catalina, Stevenson and San Benito. 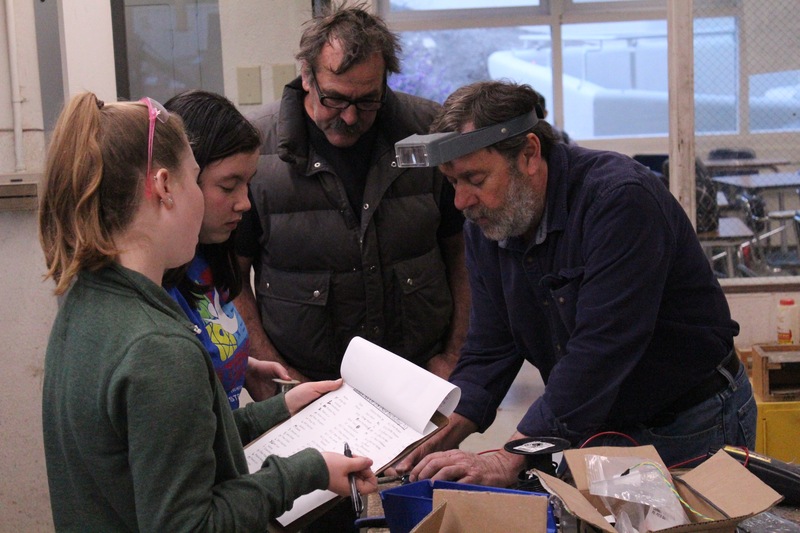 In some way or another, the mentor has helped create nine of the Monterey Peninsula’s ten teams, and thanks to people like him spanning the globe, the FRC now has over 7,000 teams world-wide. As the coach of Team 2035, he spends countless hours working on the robot every year, although he is not the only one to put tremendous time and effort into the robotics program. Small had to give up her spots on the varsity soccer and softball teams in order to fully commit to robotics. She also had to greatly diminish her working hours, moving down from two or three shifts a week to just one. As team captain, she goes to the robotics team’s Tuesday, Thursday and Saturday build sessions in their entirety, adding up to seventeen hours spent working on the robot each and every week. Many other team members also put tremendous time and effort into Carmel’s robot, though. Last year’s team captain, Andy Lambert, also has nothing but praise for her old coach, teacher and mentor. In 2017, Lambert submitted a piece about McFarlin to the Woodie Flowers Award, a competition within FRC that highlights one outstanding mentor per competition. While he did not take home this prestigious prize, the thoughtful and eloquent message McFarlin’s students made for him certainly shows a lot about his drive and his character. This year, more students have risen to the epic challenge the WFA presents, determined to give the coach they love the recognition he deserves. For this year’s robotics contest, robots must put milk-carton-sized boxes onto scales, some of which are low to the ground and some high up. The robots must be able to drive autonomously for some portions of the contest, although for most of the competition they are controlled by a human driver. Team 2035 will compete in Sacramento on March 21 and Silicon Valley on March 28.